The game includes a substantial number of data and various items of information, drawn from the main world data banks, in order to assess the new situation of the planet at all times. Indicated below are the details of the parameters taken into consideration. The simulations are classified into different categories. This engine uses the planet’s seasonal maps and temperature projections for the 21st century to simulate the weather map. Economic activities: production and consumption for over 130 activity sectors including agriculture (sale of livestock, fruits and vegetables, beverages, grains), industry (various minerals, processing industries, chemistry, automobile production...), and the service sector (telecommunication, transportation, advertising, record industry...). Social / Labor / Health: minimum salaries, family benefits, medical reimbursement, basic old age pension, unemployment benefits, working time, housing allowances, etc..
Police / Justice: crime rate, size and power of police forces and intelligence services, prisons, death penalty, traffic safety laws, etc. All characters are represented with 3D faces and express themselves orally during meetings. The game includes a total of over 8 hours of dialog. Character names reflect the linguistic roots of different countries. The artificial intelligence algorithms determine the characters’ reactions and initiatives. Each character has a certain number of variables (age, health, personality, competence, ambition, political affiliation, hobbies, etc.) that help establish a sort of table of opinions on the different subjects in the game. These opinions are then compared with players’ actions and changes in the world. Their behaviors are determined based on the character’s popularity and level of influence. These organizations intervene throughout the game. 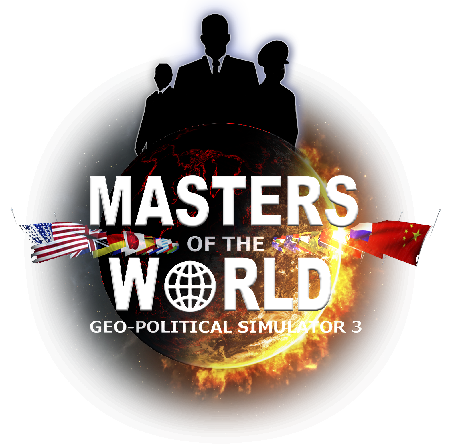 The game includes over 50 organizations, including the UN and its various branches (IMF, World Bank), major organizations (NATO, G8, OPEC, BRICS, etc. ), economic organizations (European Union, CIS, Mercosur, NAFTA, the Arab League, OAU, etc. ), major NGOs (international aid, human rights, environmental, alter-globalization, etc.). Over 150 economic sectors are featured along with their production and consumption rules (costs, raw materials, transport costs, workforce qualification, productivity...). Also included are over 100 scientific discoveries and technological advances imagined for the next 50 years to come (aids vaccine, anti-sleep molecule digital paper, optical textiles, nanorobots, holographic TV...). There are over 13,000 messages, press articles, and reactions to characters and organizations. The game also includes eight hours of recorded dialogs.